I'm asking about parks that have a majority of their attractions outdoors, so a steady or strong rain would mean many of the attractions would not be operating. Yesterday (Monday, 1/14) both Knott's Berry Farm and Magic Mountain announced early in the morning that they would be closed for the day due to a forecast of "inclement weather" (heavy rain). The storms are supposed to run through Thursday here in greater Los Angeles. The park's generally decide on a case-by-case basis whether to open for the day (or possibly close during the day). Granted, there is a safety issues with rides that cannot operate in the rain. I've read that Knott's also has an issue with flooding. 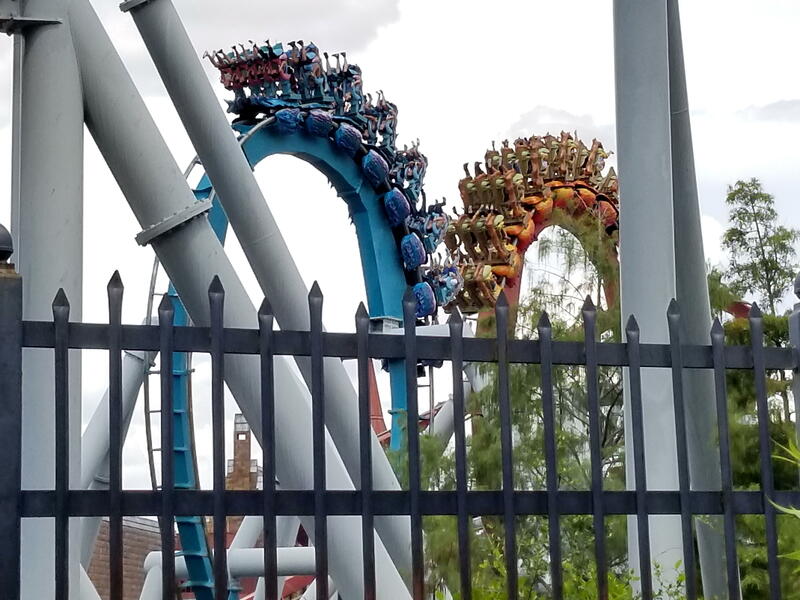 If a park expects low attendance for the day, are they better off not opening the gates if there is a decent chance of having to close later on? If storms are forecast for several days in a row, does the park try to open at least one of those days for possible out-of-towers rather than stay closed the whole time? I think it's a cost-benefit calculation by park managers. SFMM has only recently gone to year-round daily operations, so I think they're probably going to naturally be more aggressive when it comes to closing for inclement weather during weekdays where they have not traditionally operated in previous years. I don't think it's as much of a safety issue (most rides can operate in the pouring rain, it's wind that causes the biggest issue with coaster potentially valleying), as much as it is an economic one. The goodwill generated from operating for 1,000 brave souls wanting to ride coasters in the pouring rain is not worth the economic losses from having to pay all the labor necessary to open a park. Here on the east coast, parks have increasingly been either closing early or altogether for the day due to heavy rain, wind, and/or cold. Social media helps out the cause too, because parks can instantly make a call to close and still make sure guests are aware of the closure without making too many annoyed. 10 years ago, parks simply couldn't close because there was no mechanism for them to announce a closure to guests who had not already trekked to the park for the day. Even closing a park 3-4 hours early can save the park a lot of money on labor costs, especially if they can see that few decided to show up in the first place. As parks try to expand their calendars (looking for any way to increase year over year revenues to please shareholders), I think you're going to see early closures and full-day closures during the winter months more and more common. Also, keeping a park open in bad weather might not generate good will from some. I am sure that parks also factor in the expected number of complaints from people who come out in the rain (or cold, for water parks), only to discover that they can't do everything they'd be able to do on an 80-degree, sunny day. Otherwise... what Russell said. It all comes down to expected revenue from attendance and sales versus labor and operational costs. Why keep a park open on a day when you expect a big financial loss... especially if there's a risk that it won't turn out to be an investment in customer good will? I agree with all of the above. When I worked at SFOG we'd close the park under a couple of circumstances. As is widely known, when there is a lot of rain, that park can flood. Search Google for Six Flags over Georgia flooded photos and you will be amazed. The other situation was when general poor weather had in park attendance levels so low that it was costing us more to be open that we were making. I can't speak for what's done now, but back in the late 80's, we'd stand at the park exit handing non-AP holders one-day return tickets to come back for another visit. People were 95% glad for the offer to come back on a nicer day. Parks like Knott's and SFMM probably see only about 2,000 guests on a nice weather off-season weekday, so when they're likely to see maybe a quarter of that on a rainy day it makes more economic sense to close the park for the day than keep it open for such a small group. Additionally, many outdoor attractions do not operate in steady rain, so if the forecast calls for it throughout the day then the few visitors who would stop by would only have a handful of rides to experience. The decision whether or not to open for a given day is almost certainly decided that morning based on the current weather and crowd forecasts. A day with showers that would likely see a decent crowd otherwise will probably result in the park opening, but a day with constant rain and a minimal crowd isn't going to be worth the expense. Most parks only close for weather a handful of times each year, and they are usually parks that attract primarily locals who can reschedule their visit vs. out-of-town guests who only have one possible day to go. Thank you, everyone, for your information and replies. Yesterday was probably one of those days when the cost benefit calculation did not work out well for a specific park. Because the weather forecasts were for four days of steady rain, I think most people did not expect Knott's Berry Farm to open until Friday. On Tuesday morning I was watching Knott's social media for an announcement that they would be closed that day. There did not end up being an announcement, and in response to my question Knott's told me around 10 am (park opening) that they were open that day. Maybe Knott's has better weather forecasters than the National Weather Service, but starting from mid-morning there was basically no rain until about 2:30 in the afternoon. I didn't get to the park until about 11:15, but I was amazed at how empty the park was. The roller coasters I saw operating had maybe one or two people on board. I estimate that there were maybe 150 people in the park around noon. Throughout the day I saw ride operators standing around waiting for riders. Popular attractions like Ghost Rider and Hangtime were basically walk-ons. Slow loaders like the stagecoach had no more people waiting than would fit the next ride. On the plus side for Knott's, many 75% of the restaurants (including places like the Boardwalk BBQ) were closed, so I was a little frustrated in my attempts to try out my new season meal plan. Also, the entertainment schedule is very light right now. No Mystery Lodge, no kid's shows in Camp Snoopy, no Western stunt show, no Native American dancer. The Calico Saloon show, Peanuts meet and greet, and a street show in Ghost Town were the only options on the schedule. The upshot is, if everyone expects you'll be closed due to the rain, and you end up opening, the crowds will be *very* light. >>>Should it rain for more than 3 consecutive hours during your visit to Blackpool Pleasure Beach, don’t let it dampen your spirits! Unless something has changed regarding the crowds at Knotts, weekdays in January have always been totally dead. Actually Knotts pretty much any time other than weekends and holidays (not counting Haunt) is totally dead. In the past 15 years every time I have gone to Knotts I have never actually seen any kind of crowd whatsoever. I used to sit on Xcelerator for as many times as I want without having to get off (when it was operating), in the middle of the day, and that was the norm even though it was still a relatively big new ride. Unless it's torrential rain, the crowds are not a lot lighter for a gray, wet day here in Orlando. People still have their designated days to visit a park, so it's either go, or miss out completely. Cold seems to keep the tourists away more ... and of course 99% of the locals ... LOL !! I don't mind wandering around in the wet, but riding the coasters is a whole other ball game. The worst ride of my life (literally) was on the Mako a couple of years ago. We were in the station and the weather was OK. In a blink of an eye, it started to pour with hard rain .... and they sent us off !! OMG .... for 1m 45s it was like someone was sticking red-hot needles into me and when we got off I might as well have jumped into the lake below the coaster. The best ride in the wet was during a drizzly day at Cedar Point. We got on the Mean Streak late in the day, and it flew ... a crazy, fast, intense ride that made up for all the bad rides we'd had on previous visits. the_man: I've been visiting Knott's on weekdays during January for the past five years, and I have never seen so few people in the park or in line for major rides there as I did on Tuesday, 1/15. Even on slow days, it is unusually rare not to have to wait for at least 10-15 minutes for GhostRider, a very slow loader, except right at park opening. I realistically don't expect to ever see the park at such a low crowd level again.